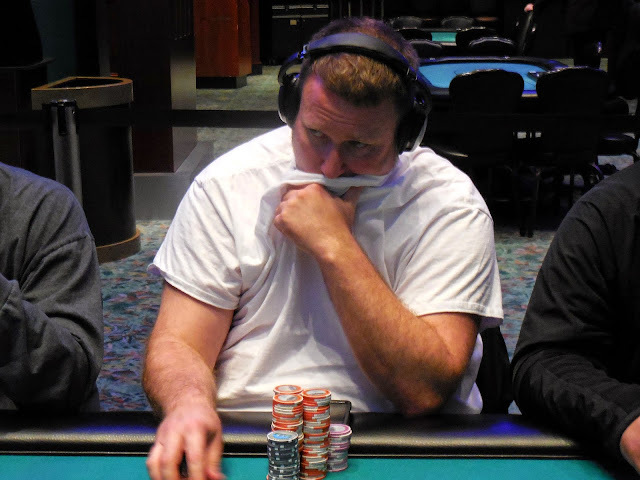 As we walked up to count Mark Dube's stack, he was eliminated. A full list of surviving players and chip counts will be posted later today. Meanwhile, Flight A's clock has been paused. The field will play three more hands before bagging up for the day, and we will post chip count updates shortly thereafter. Flight B has just begun play. 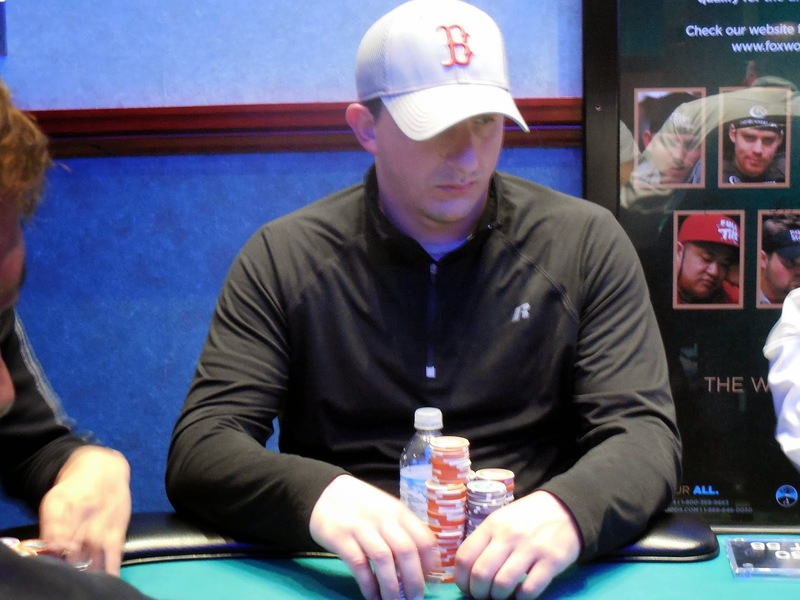 The board read [7c][6d][Ac], and James Campbell was all in holding [Ah][9s] and was up against Chad Brown's [9h][8h]. The [5c] turn completed Chad's straight, but James had a gutshot to a bigger straight. The [Jd] river meant Chad would win the hand. The stacks were counted down, and it was confirmed that Chad had James covered. 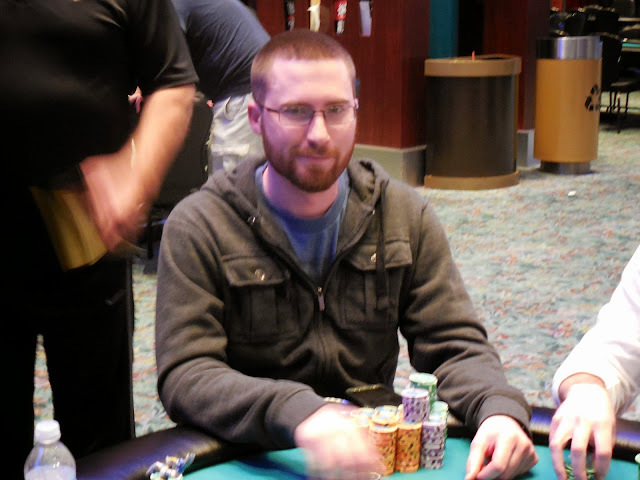 James will exit the tournament in 2nd place for $17,984. 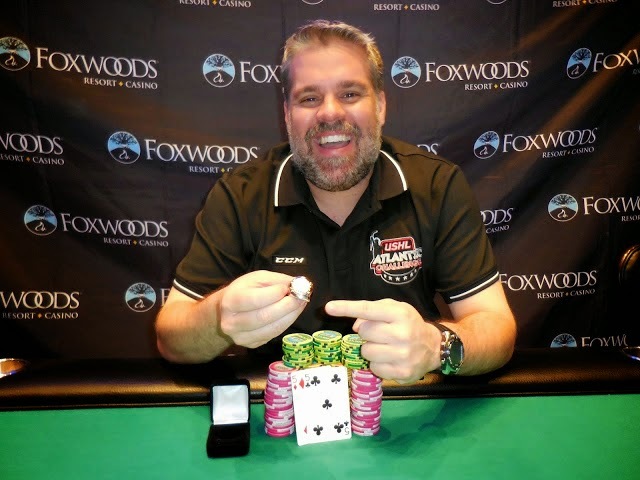 Chad Brown has won his first WSOP Circuit ring, along with $29,100 for 1st place. Congratulations, Chad! Chad Brown had James Campbell on the ropes, and James was all in with ten-eight against Chad's ace high. James turned a straight to double up and survive. A few hands later, again Chad had James in bad shape with queens to eights, and again James found a straight on the river. For a third time, Chad had James all in. This time James had ace-six to Chad's eight-seven. The ace high held up, and James will double up to 586,000, now only slightly behind Chad's 774,000. Chad Brown was all in preflop holding [Qs][Jc] and was flipping with James Campbell's [9d][9c]. The [Ts][Jh][2h] flop gave Chad top pair, and the [2d] turn and [5c] river changed nothing. 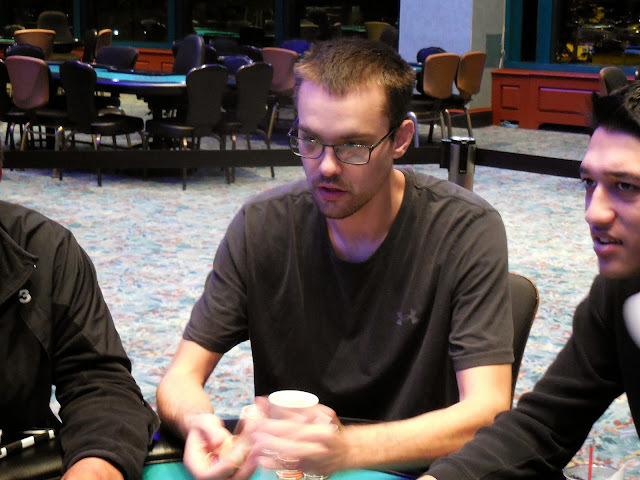 Chad's stack was counted down to 440,000, and he will double up to take the chip lead. James will be left with 500,000, but it is still anyone's game as they are playing 8,000/16,000 blinds with a 2,000 ante. Joshua Silva raised the small blind and Chad Brown called from the big blind. The flop fell [Ts][Qd][Ks] and Joshua moved all in. 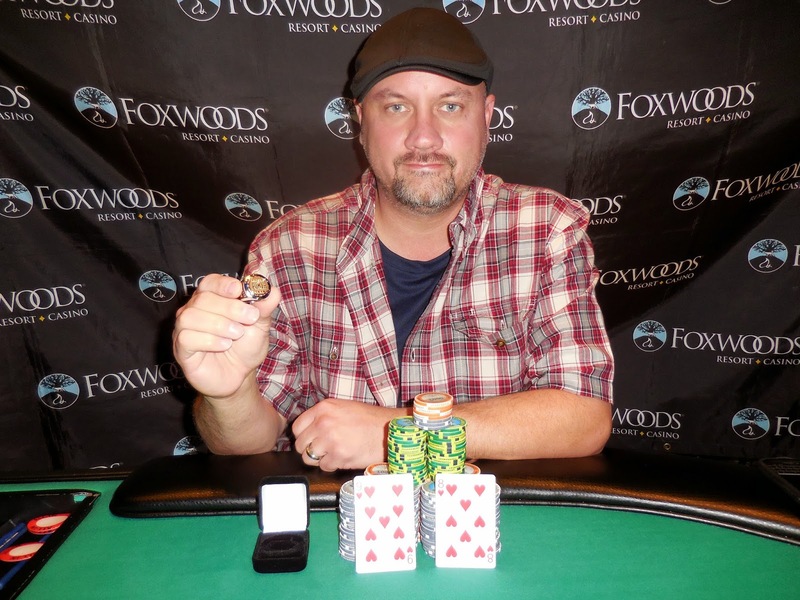 Chad made the call, showing [Kc][Tc] for two pair. Joshua held [Qc][7s] and would need to catch a queen to survive. 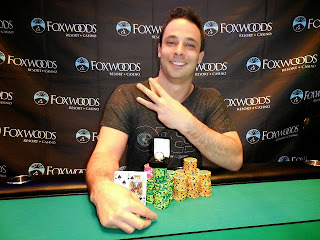 The [6c] turn and [8h] river meant Joshua will exit this tournament in 3rd place, good for $12,804. This is a two day tournament. If needed a third day will be added. Players eliminated from Flight 1A may Re-Enter Flight 1B. 3 players remain from a starting field of 92 entrants. 9 players remain from a starting field of 89 entrants. Levels 1-12 will be 30 minutes. Remaining levels on Day 1 will be 40 minutes.Day 2 levels will be 40, 50 & 60 minutes. Play has concluded for the day in Event #3 $1,125 NLH. 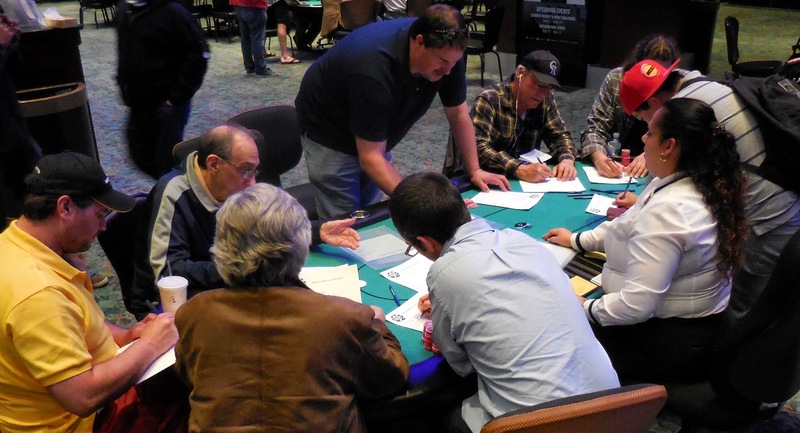 Play was three handed when it was decided to play an extra level in Day 1. Though there were many allins during the level, the short stack kept doubling up. So the same three players will return at 1pm EST to play down to a winner. 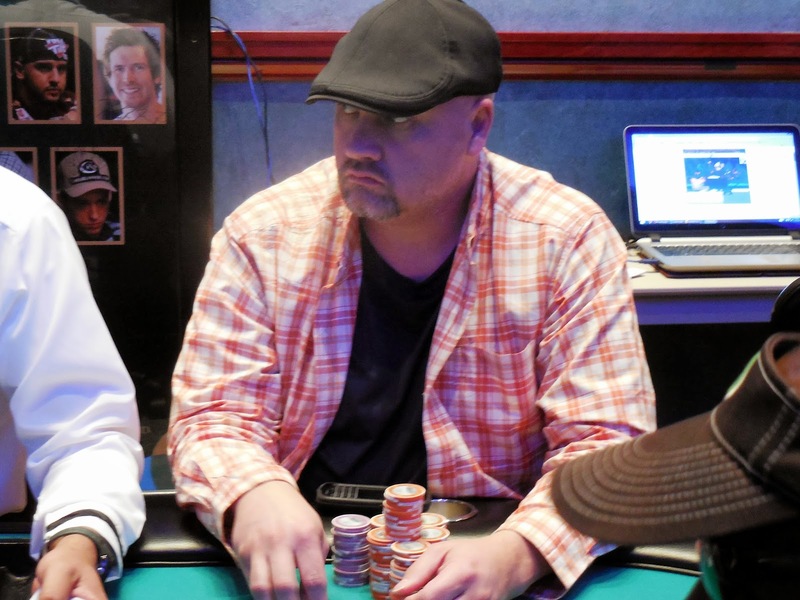 James Campbell moved all in from the small blind, having Chris Tryba in the big blind covered. Chris called all in with king-jack, and was slightly behind James's ace-deuce. 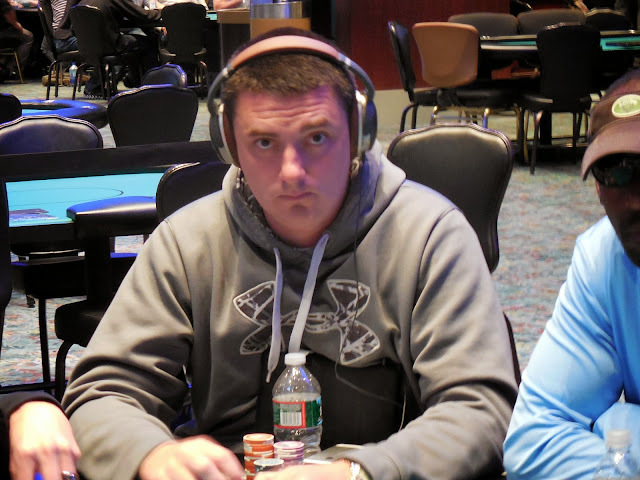 Chris found no help and will exit this tournament in 4th place, good for $9,303. 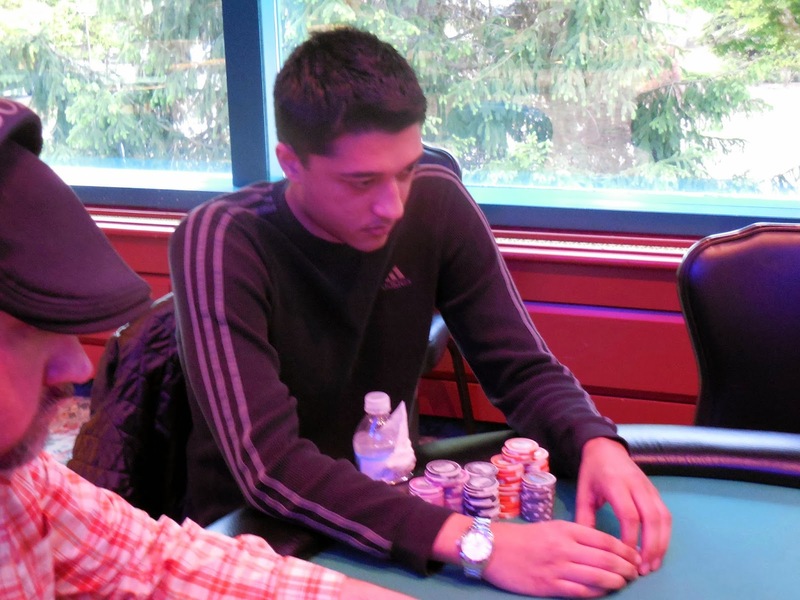 Akash Mazumdar put the last of his chips in with [Ks][7s] and was called by James Campbell holding [Ah][Ts]. Akash said, "Ooops," and the dealer spread the [Kd][9h][Qd] flop. James would need to catch an ace or a jack to send his opponent to the rail. The turn [Tc] opened up a few more outs for James. The [Js] hit the river to put a straight on board, but James had a bigger straight with his ace. Akash will exit this tournament in 5th place, good for $6,887. Taylor Black moved all in with [Ah][7c] and was snap called by Chad Brown who held [As][Ac]. As the flop fell [Ad][2c][4s], all Taylor could say was, "Wow," as he got up out of his seat. The turn and river fell [6h][6s] to give Chad a full house, and Taylor will exit this tournament in 6th place. He will earn $5,199 for his efforts. We saw a three way all in with both Taylor Black and Joshua Silva holding ace-king, and Akash Mazumdar holding [Qh][Jc]. Knowing the odds, Chris Tryba joked that he wanted to bet his stack on Akash's hand. It would have been a good bet, as the flop fell [4s][Ts][Qs], giving Akash top pair. He would still need to dodge quite a few cards, as one of the players held the [As]. The turn fell [4h] and the river [6d] to triple Akash up, bumping his chip count to 369,000.